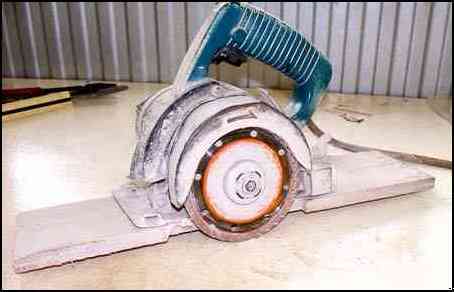 Introduction | Angle Grinder | Small Wet Saw | Cup Disk | Polished Concrete Floors. Used mostly for cutting Besser blocks,(hollow concrete) but it has also done a lot of service cutting masonry walls for chasing grooves for plumber or electrician. Just about always done dry. This one looks like it would be more suited to wet cutting, as it does not have the expansion gullets (slots) and holes in the blade that are more typical for dry work. This is the hard way of course, doing two cuts, and then removing the middle with a chipping hammer. You can buy a diamond blade that will cut the groove in on hit. Of course it is a specialist tool for large construction site. Diamond tools can be used dry, just give them a rest quite often to help them cool down. You are grinding away at usually a very hard surface with another harder surface. that generates a lot of heat. Some guys say let them run for a while out of the cut, free spinning, to help the blade cool down. I don't bother. Diamond tools - My small Makita 100mm wet saw. My small 100mm wet saw has cut a few ceramic tiles, but not many as there are better tools for the job. Where it shines is cutting compressed fibrous cement sheets (CCFC). Up to 12mm it cuts them like butter, the 16mm and over are a bit slower cutting but still easy. In the shot here I have screwed a piece of plywood to the base, to make it easy to use with a straight edge to cut straight lines. I used this set up to cut the 12mm CCFC sheets on these stairs. This shot shows the arrow on the saw guard, which is the direction of rotation. Opposite to a normal (sidewinder) circular saw, It is a left hand thread, don't get trapped. 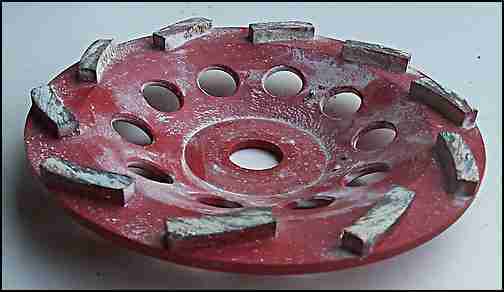 Diamond tools - A 180mm cup disk, comes in various patterns and grades of grit. This one is for quick removal of concrete bumps. The 180mm cup disk above is also for the 235 grinder. 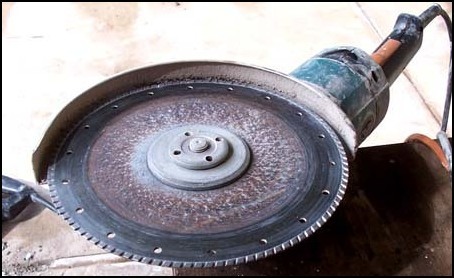 Used for grinding back concrete floors and masonry walls for ceramic tile preparation. I first used one of these while preparing a large floor for ceramic tiles. We hired a young guy with a large machine grinder to surface the floor and we trimmed around the edges and corners with one of these where the big machine could not get. The young guy mentioned above was using a two head grinder, and he stopped every half hour to turn the diamond pads 180deg. in his big machine. He explained that it balanced the wear on the blades. I guess he was right, but that was not the main reason. I later worked with a lot larger and more sophisticated grinder doing polished concrete floors. This machine had a switch to reverse the rotation of the cutting heads. After say half an hour cutting one way, I reverse the rotation, and straight away I can feel the machine cutting better. When it appears to be spinning easier and not biting the same, I reverse again, and so on. I guess what is happening is the switch in rotation exposes a different edge of the diamonds at each change. Grinding floors with a big machine is nearly always done wet. The machine cuts better, but mainly there is no dust. An amount of water to keep a soupy slurry around the cutters seems to work well. You don't need lots of water. If you are thinking of getting some grinding done, be prepared for a lot of mess. It takes a lot of cleaning to get rid of the slurry. I use a large squeegee to help to keep it under control. Clean up while everything is still wet, again and again, as when that mud dries it is so fine that it is nearly as hard to shift as cement dust. Concrete Counter Tops and Polished Concrete Floors. This is a subject on it's own, and I will be writing a page on this later. I need to go back to a couple of jobs I have done and take some photos. Once just for specialists, concrete surfacing tools were 100% air operated. Now small compact electric tools are available. As far as the tools go, there are many on the market. I have used a large coarse diamond grinding cup disk like the one above, down to 100mm cups of varying grades to plastic faced type polishers. The dedicated grinders have their own built in ELD protection and they feed the water in through the center hub of the disk.They are not cheap to buy and they are not cheap on consumables. You need quite a kit from course to fine wheels to make a reasonable job. Floor grinding falls into two sections. Preparing a floor for another surface, like ceramic tiles, and grinding and polishing the concrete floor to an acceptable finish on it's own. Check out this page, a submission from one of my readers, showing a really top finish on some polished concrete floors. My local hire company used to measure the size of a diamond blade before the hire started, measure it on return, and charge for the difference used. I once took a blade back on a Monday morning that was bigger than when I got it out on Friday afternoon, after using it all weekend. I used to have a larger 24" dia, 3cyl. petrol engined diamond saw for cutting concrete, that had slow cutting speeds, but also would travel at a reasonable walk. I used to cart it around in one of those all time classic vehicles, a Mazda Bongo van. It is recommended that the blade be removed from the saw, with all of these self propelled machines when walking them distances for safety reasons. Do not try to load one of these machines into a vehicle (i.e. a bongo van) with the blade still attached. You run the risk of slicing though the main structural section of one side of the van, if your ramp slips.